For other people named George Pearce, see George Pearce (disambiguation). 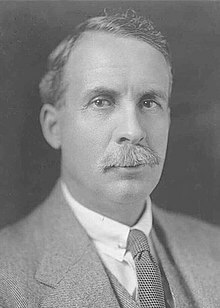 Sir George Foster Pearce KCVO (14 January 1870 – 24 June 1952) was an Australian politician who served as a Senator for Western Australia from 1901 to 1938. He began his career in the Labor Party but later joined the National Labor Party, the Nationalist Party, and the United Australia Party; he served as a cabinet minister under prime ministers from all four parties. Pearce was born in Mount Barker, South Australia. He left school at the age of 11 and trained as a carpenter, later moving to Western Australia and becoming involved in the union movement. He helped establish the Labor Party there, and in 1901 – aged 31 – was elected to the new federal parliament. Pearce was elevated to cabinet in 1908, under Andrew Fisher, and served in each of Fisher's three governments. He continued on in cabinet when Billy Hughes became prime minister in 1915, and after the Labor Party split of 1916 followed Hughes to the National Labor Party and then to the Nationalists. Pearce also served in cabinet under Stanley Bruce and, after joining the UAP in 1931, Joseph Lyons. He was perhaps best known for his service as Minister for Defence, holding that position from 1908 to 1909, 1910 to 1913, 1914 to 1921, and 1932 to 1934. His 24 years in cabinet and 37 years as a senator are both records. Pearce was born in Mount Barker, South Australia, the fifth of eleven children born to Jane (née Foster) and James Pearce. His father was a blacksmith of Cornish descent, while his mother was born in London. An uncle, George Pearce, briefly served in the South Australian House of Assembly. Pearce grew up in the small town of Redhill, attending the local public school. He left school at the age of 11 and began working as a farm labourer, but later secured a carpentry apprenticeship. He moved to Adelaide once he completed his training, but struggled to find work during the economic downturn of the early 1890s. In 1893, Pearce moved to Coolgardie, Western Australia, to take advantage of the gold rush, working as a prospector with little success. He later settled in Perth and resumed his work as a carpenter, joining the Amalgamated Society of Carpenters and Joiners. He became prominent in the local labour movement, and in 1897 led a strike on building sites that led to him being blacklisted for several weeks. On 4 April 1897, Pearce married Eliza Maud Barrett at Trinity Church, Perth. They had two sons and two daughters together. In 1893, Pearce helped found the Progressive Political League, a precursor to the Western Australian branch of the ALP. Self-educated in politics and economics, in 1901 he was elected to the first Commonwealth Parliament as a Senator for Western Australia. He narrowly missed out on being a member of the first Labor Party Cabinet when Chris Watson became Prime Minister in 1904. Pearce was Chairman of Committees in the Senate from 1907 to 1908. In 1908, he became Minister for Defence in the Cabinet of Andrew Fisher. He oversaw the foundation of the naval college at Jervis Bay and Royal Military College, Duntroon. In 1914 Australia entered World War I. Upon Billy Hughes' ascension as Prime Minister, Pearce was named Deputy Leader of the party. By this time, Australia's prosecution of the war made the introduction of conscription an intensely divisive issue for the ALP. Pearce was convinced of the necessity of introducing conscription, but the majority of his party did not agree. Pearce, along with many other of the party's founding members, subsequently followed Hughes out of the party and into the new "National Labor Party." A few months later, the National Labor Party merged with the Commonwealth Liberal Party to form the Nationalist Party, with Hughes as its leader. For much of 1916, Prime Minister Hughes was out of the country as a member of the Imperial war cabinet. During this time, over seven months, Pearce was acting prime minister, the last senator to fill this role for any significant length of time. Most of the defectors to the Nationalists subsequently faded into obscurity, but Pearce went on to have a successful career in the party of his erstwhile opponents. After Hughes was deposed as Nationalist leader, Pearce accepted a position in the ministry of Hughes' successor and rival, Stanley Bruce. He became the inaugural Father of the Senate in 1923. He was appointed a Knight Commander of the Royal Victorian Order (KCVO) in 1927. In 1932, Pearce joined the newly formed United Australia Party, and served as a minister in the government of Joseph Lyons until his defeat at the 1937 election (his term ended in June 1938). He was a Senator for 37 years and three months, a record term. His total service as a minister was 24 years and seven months, also a record in the Australian Parliament. At the time of his death, he was the last surviving member of the 1901-1907 Senate, which includes the first Australian Parliament - though MHR's Billy Hughes and King O'Malley would outlive him. Pearce died at home in the Melbourne suburb of Elwood, survived by two sons and two daughters. RAAF Base Pearce, Antarctica's Pearce Peak, the Electoral Division of Pearce and the Canberra suburb of Pearce are named after him. ^ a b c d e f Beddie, B. (1988). "Pearce, Sir George Foster (1870 - 1952)". Australian Dictionary of Biography. Canberra: Australian National University. Retrieved 2007-10-20. ^ a b PEARCE, SIR GEORGE FOSTER (1870–1952), Biographical Dictionary of the Australian Senate. Retrieved 27 December 2017. ^ "Appendix 3―Deputy Presidents and Chairmen of Committees (1901–2009)". Parliament of Australia. Retrieved 2017-09-10. Pearce, George (1951). Carpenter to Cabinet: Thirty-Seven Years of Parliament. Hutchinson. Heydon, Peter (1965). Quiet Decision: A Study of George Foster Pearce. Melbourne University Press. Connor, John (2011). Anzac and Empire: George Foster Pearce and the Foundations of Australian Defence. Cambridge University Press. Wikimedia Commons has media related to George Pearce (Australian politician).